Our first composting, urine-diverting toilet (using a ToiletTech mechanism) was installed and commissioned March 2019 at Zorro Bay! More toilets to follow! Six new recreation sites were established in Howe Sound in 2015. These campsites are only accessible by boat and provide a vital link between the Lower Mainland, Squamish, and the Sunshine Coast. They were developed jointly by the BC Marine Trails Network Association and the Trans Canada Trail Foundation with the assistance of the Squamish First Nation, local Regional Districts and municipalities and Recreational Sites and Trails BC (RSTBC), a branch of the Ministry of Forests, Lands and Natural Resource Operations. Work, done mostly by club volunteers, has involved re-positioning boulders to make boat runs, brushing and levelling tent pads, putting in steps up steep banks to facilitate access, installing picnic tables, adding signage and log books, building short trails and a footbridge, removing hazard trees, installing bear-proof food cache boxes and stringing up bear cache wires. In addition, maintenance trips starting in 2017 have picked up garbage left behind by thoughtless visitors and clearing away unwanted and poorly placed unofficial fire rings. A local contractor built our first real toilet in 2019. SKABC's future plans include installing more low-maintenance composting toilets, improved and increasing the number of tent pads. Access trails will be improved too, including kayak 'parking' at sites with inadequate beach space. Look for our visitor logbooks to sign in, make suggestions for physical improvements or report on how the site is being managed. Suggestions can also be sent to Steve Best, our Howe Sound Steward at s2smarinetrail@skabc.org. We hope visitors will send in comments - maybe with their smartphones while they are still at a site. SKABC volunteers visit and maintain each site at least twice annually, at the start (May) and at the end (October) of the main camping season. Transportation of people tools and supplies are generally by power boat or water taxi. Through fundraising events and donations, we seek to keep access to these sites free to the general public. 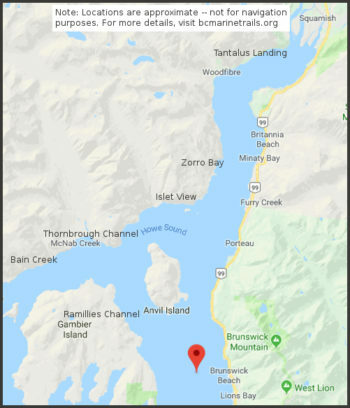 SKABC happily accepts donations in coordination with BC Marine Trails to fund future improvements and maintenance to the Howe Sound campsites. Thank you for supporting this great recreational opportunity.